In 1989, a small group of New Orleans citizens joined forces to rescue the abandoned Davis monument on Canal Street. A plan was developed, funds raised and many experts and resources were brought together to preserve this beautiful monument that is one of the best works of renown sculptor, Edward Valentine. This restoration project was no small effort, but proved to be a successful endeavor. Noticing that there was an abundance of other neglected monuments in the city, the original volunteers decided to stay together and perform more restorations. It quickly became apparent that the city had no dedicated funding or comprehensive plan in place to properly care for our beautiful monuments. Of all the noteworthy historical preservation efforts in the city, monument preservation was not one of them. In a short time, the MTC grew in volunteers and became incorporated in Louisiana as a non-profit corporation and also received US Internal Revenue Service status as a 501c (3) tax exempted organization. The volunteers learned a lot about approved monument restoration methods and were also able to bring professional metal and stone experts into our group. During this time, the MTC gained the respect of several city agencies and also was able to establish good relationships with many neighborhood organizations. Some of our restoration projects include those monuments to Ben Franklin, John McDonough, the Women’s Army Corps, Samuel Lowenberg, The Ninth Ward Victory Arch, Col. Dreux, Henry Clay, the Banks St. WWII, and many others. After Hurricane Katrina in 2005, the MTC initiated a city-wide survey to locate and ascertain the condition of all monuments. Volunteers were grouped into teams and assigned different parts of the city and set about photographing, measuring and taking notes on all monuments. Until this time, our list of monuments was approximately 88. After the survey, we were all surprised to learn that there were over 200 monuments located in all parts of the city. Along with traditional statue and pedestal type pieces, we found many smaller stone markers, inscribed flagpoles, plaques and other types of monuments. It was the realization at this time that the original grass-roots effort would not be large enough to effectively handle such a ‘monumental task’. Immediately, the committee took action by restructuring our Board of Directors, moving from a kitchen table to an actual office building and hiring our first professional director to help us better manage our program. Also around this time, the MTC brought down from New York, the professional services of the reknown Mary Jablonski of Jablonski Building Conservation, Inc. to help us further evaluate the monument’s conditions and develop restoration and cost plans. This project proved very insightful as we were able to discover several important monument problems that are very serious and not readily noticeable. As the MTC enters its third decade of service, we will not be resting on our laurels. 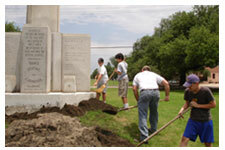 A newer and more comprehensive city-wide monument restoration plan is presently in development. Professionals with specific education and experience are being added to our restoration projects resources group. And of course, major new fundraising programs are commencing. We have lots to do and are excited about all that can be achieved through the support and dedication of those that love New Orleans and her monuments as much as we do!